If you haven’t noticed, Baby Lady & I eat a lot of salmon. We love its full flavor and its adaptability to a variety of flavors and uses. It’s also high in Omega 3 fatty acids and has wonderful health benefits. Now, technically, salmon is the common name for for several species of fish in the family Salmonidae. Trout are also members of the Salmonidae family but that is for a different post. Did you know there are 8 different types of commercially important salmon? Atlantic salmon, Chinook (King) salmon, Coho salmon, Chum salmon, Pink salmon, Sockeye salmon, Masu salmon and Steelhead. Depending upon the type of salmon you use, the flavor is different. Coho salmon are also known as Silver salmon. They look like silver torpedoes in the water. They spend one to two years in freshwater before migrating to sea and require small headwater streams for the pre-migration period. Originally Coho salmon was one of the most commercially sought after species but now it is depleted in many areas due to wildlife practices and over fishing. Coho’s flavor is a blend of the Sockeye and Chinook. Coho tastes more rich than a Sockeye, but with a stronger natural flavor than a Chinook. Chum salmon, are also known as Dogs for their canine-like teeth, or as Keta after their Nanai (Asian aboriginal group) name. They have the broadest geographic range of all the species, extending from California to Korea and spawn low in river systems. They migrate to the sea soon after hatching. Their flesh color may vary from white to pink to red. They also have a drier flesh well-suited for smoking. Pink salmon, also known as Humpies, are the most abundant of the species and the smallest of the species. They often spawn in estuaries or lower reaches of rivers and migrate to the sea soon after hatching. They have a two-year life cycle with alternate even and odd year runs. Pink salmon have the lowest fat content of the species and are frequently used for canning. Sockeye salmon, also known as Reds, are the prettiest of the species in my opinion. They have the darkest flesh of the species and their name comes from the First Nation sukkai, meaning “fish.” They have the greatest variety of life history patterns in that they spawn not only in rivers but also in lakes. They also often spend one to three years in freshwater before migrating to sea. Because of their ability to adapt, some populations have become land-locked, and are known as kokanee salmon. 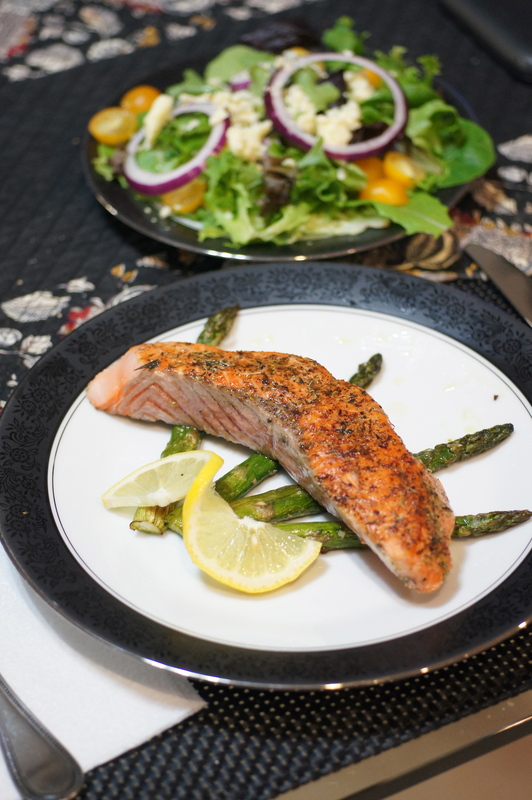 Sockeye has a cleaner flavor than Atlantic salmon and is less rich tasting than King or Coho. Steelhead, also known as steelies, live as much as four years in freshwater before migrating to sea. In fact, they may mature without ever leaving fresh water, in which case they are called rainbow trout. Many people believe steelhead is the precursor to salmon. Unlike most species of salmon, steelhead often do not die after spawning, but will re-migrate to the ocean. They are highly prized by anglers for their fighting spirit. 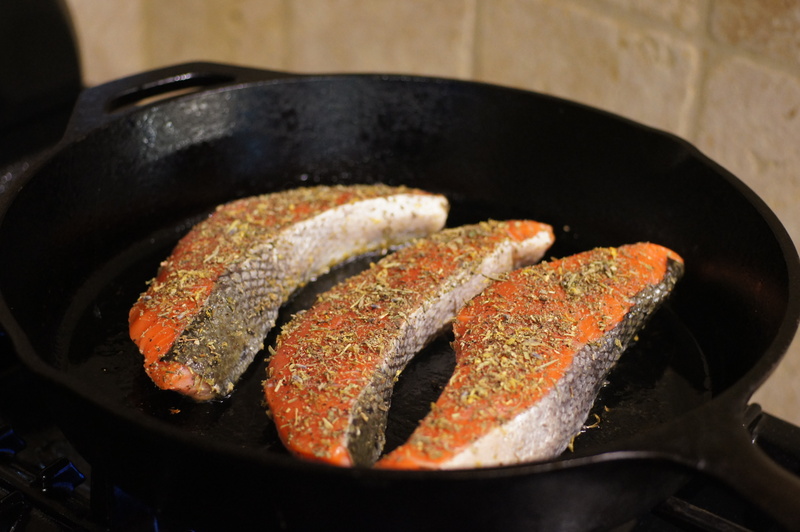 Steelhead have orange flesh, but the flavor is milder like a cross between salmon & trout. The flesh has medium flakes and a tender texture. Atlantic salmon, also known as the “King of Fish,” is a highly prized game and food fish that was native to New England rivers. As a consequence of industrial and agricultural development, most populations native to New England were extirpated and they are now listed as an endangered species. Remnant native populations of Atlantic salmon in the United States now persist only in Maine although restoration efforts have been underway for several years. Atlantic salmon spawn in freshwater during fall and the young remain in freshwater one to three years in New England rivers and migrate to the ocean in spring. Atlantic salmon, however, is farmed and farmed salmon constitutes the bulk of commercially available salmon today. The flavor of Atlantic salmon varies widely depending on the quality of the farm it came from. It tends to be lighter in flavor and color than it’s wild counterparts. Masu salmon, also known as cherry salmon, is found in the Western Pacific Ocean along East Asia. When they reach sexual maturity they have a darkened back, and the stripes on the body sides become bright red with crimson tinge to merge on the abdomen into one common longitudinal band of lighter color. They are also one of the smaller species tending to be 28 inches long and weighing 4.5 – 6 lbs. 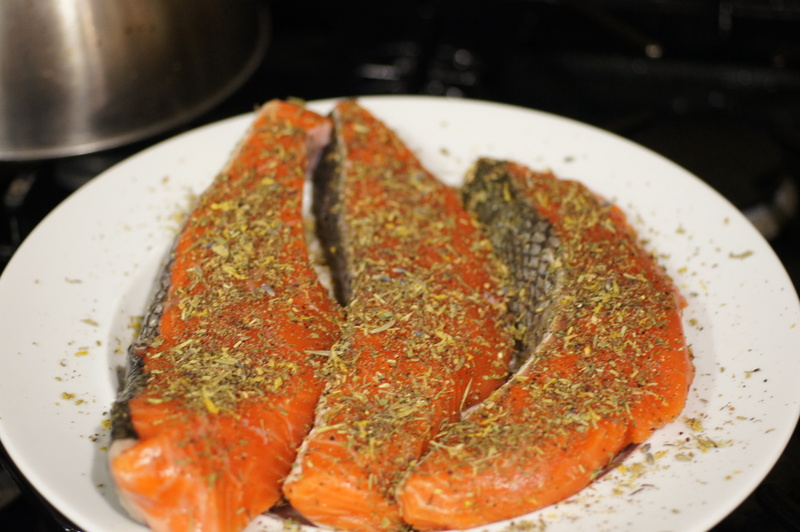 The salmon used in this recipe was wild caught Chinook Salmon. I prefer its texture and flavor although any salmon will work. Chinook has a buttery, creamy, and rich flavor which I really like. Because it is typically caught wild it has a denser flesh, as well. Regardless of they type of salmon you choose, however, this recipe is delicious, quick and simple. We hope you give it a try. 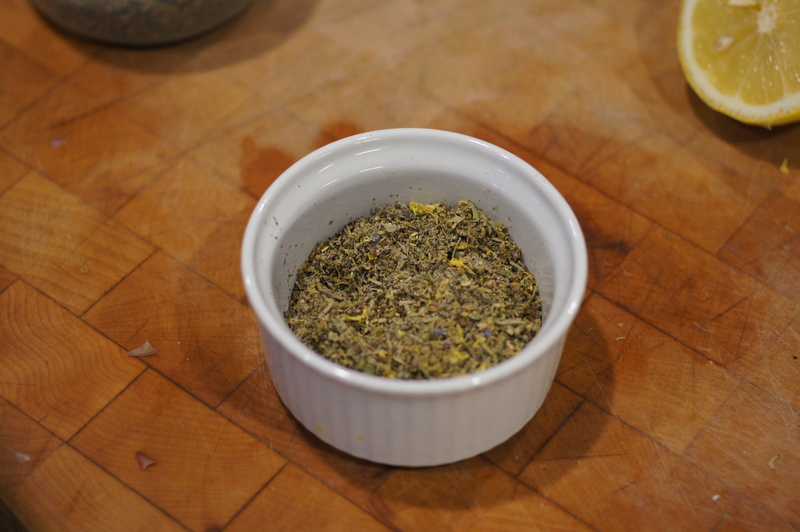 For the Herb Crust: Mix all the ingredients together in a bowl and set aside. Take the asparagus and bend each one until it snaps. Each spear will snap in its own place. It’s sort of magical how each spear snaps right above the spot where the asparagus turns woody. Once done, oil a sheet pan with olive oil. 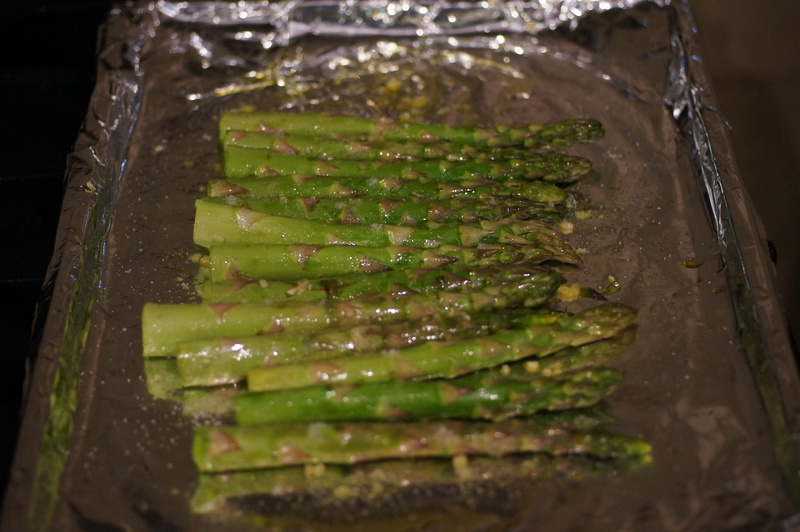 Place the asparagus on the sheet pan and mix with the minced garlic. Season with salt an freshly ground black pepper. Line the asparagus in a row and place in a preheated 350 F oven. Roast for roughly 15 – 20 minutes. While the asparagus is roasting, season the salmon with the herb crust. About 6 minutes before the asparagus is done heat a skillet over high heat. Add 2 Tbsp olive oil and place salmon in the skillet. 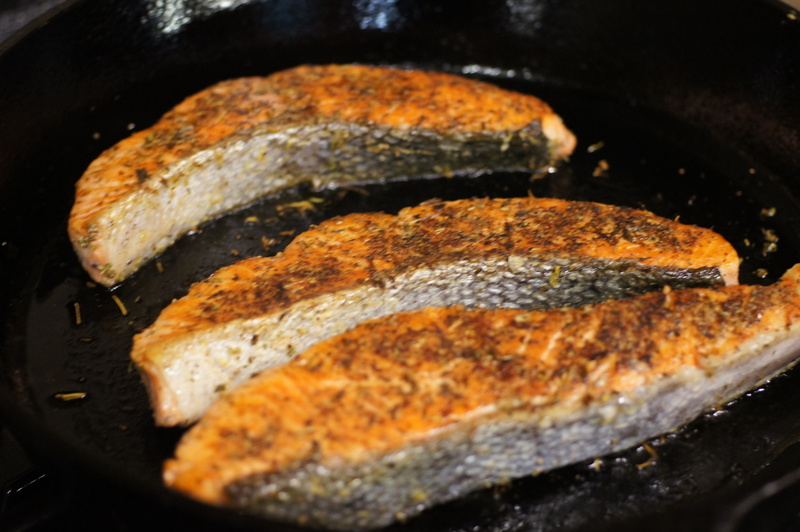 Cook the salmon for 2 – 3 minutes depending upon how done you like your salmon and turn. The salmon should be done when the asparagus is done. 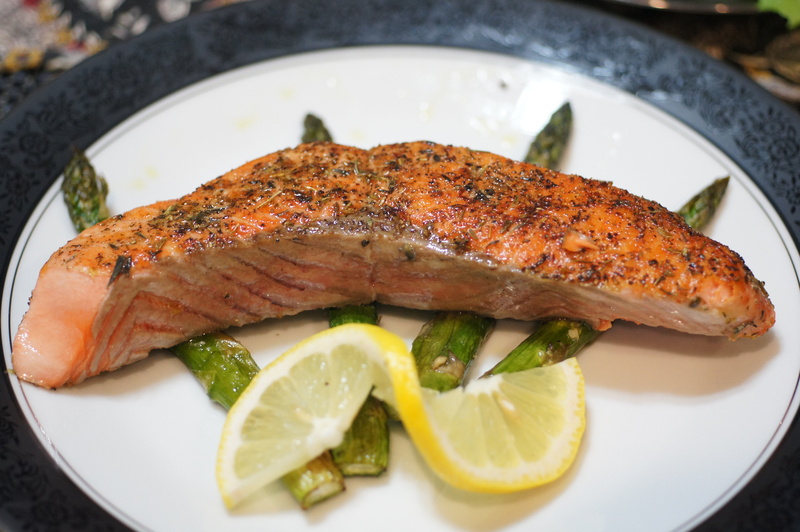 To Plate: Remove the skin from the salmon, Place 4 asparagus spears on the plate with the tips facing the rim of the plate. Place a salmon filet on top of the asparagus. Drizzle the salmon with 1/e lemon, juiced. Slice a lemon slice in half and twist for garnish. Serve with a nice garden salad and enjoy! This certainly does look delicious, Richard, and roasting asparagus is such a great way to prepare it. There’s a creek running behind what was my parent’s home, as well as that of my Uncle and ZIa’s. In the late 70’s and into the ’80s, Michigan’s DNR would release Coho hatchlings into the creek each Spring. 5 years later, they would return to spawn. It was amazing to see this little creek teeming with Coho! Financial concerns led to the end of the program and eventually the Coho stopped coming, never having really attained a sustainable population on their own. Stil, it was something to see and such a treat each year. Wow! That must have been a sweet sight to see. I always love going to the Pacific Northwest and watching the salmon run. They have such an intriguing life cycle. An interesting fact is that when they return to spawn, they stop eating and actually starve themselves to death. You can catch them because they are such an aggressive fish they attack the lure/fly. A very interesting post. Our lake in Maine has landlocked salmon that are considered a game fish with two seasons a year but I have never seen one. Hi Karen, I’ve never fished in Maine but have gone to the Northwest a couple of times to fish for salmon. It’s a great game fish and tastes sooooo good. With Daniel in Portland maybe I will find out when Salmon season is and take Daniel with me. Would it be weird if I cried over how beautiful that salmon looks? Yum!